Secret Service Investigating Kathy Griffin for Trump Beheading Photos -Truth! - Truth or Fiction? Secret Service Investigating Kathy Griffin for Trump Beheading Photos -Truth! Secret Service Investigating Kathy Griffin for Trump Beheading Photoshoot –Truth! 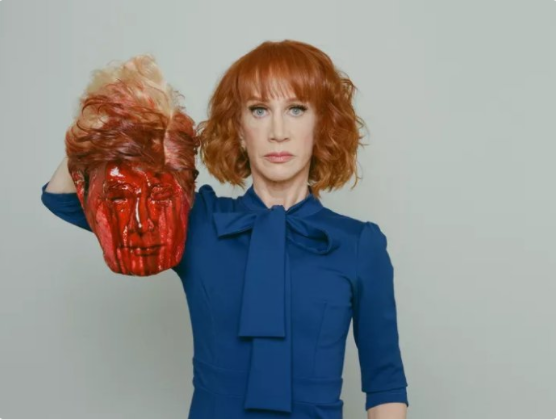 The Secret Service is investigating comedian Kathy Griffin for performing a mock beheading of President Trump and posing with a replica of Trump’s severed head in a photoshoot. The CIA has confirmed that it’s investigating the circumstances surrounding Kathy Griffin’s controversial photoshoot, which depicted a mock-beheading of President Trump that ended with Griffin posing with a replica of the president’s dismembered head. A controversial photo by Tyler Shields that depicts Kathy Griffin posing with a replica of President Trump’s severed head has sparked public backlash and a Secret Service investigation. No, I’m never the guy that’s like, “We’re making this piece of art so people are gonna go hurt other people because of it.” I always look at it like, when you make something, it makes people not want to do it. That’s just me personally. But again, the great thing about making something like this is that, look, you make it and people have their opinion on it and that’s the fun of it. A compliment and an insult are the same thing; the insult just takes longer to write. In the end, it’s true that the Secret Service is investigating Kathy Griffin’s controversial photoshoot. But it’s not clear what the focus of that investigation is, and whether it will be considered simply “offensive” material that’s covered under the First Amendment or a legitimate threat to President Trump. Is the CIA investigating Kathy Griffin for posing with Trump’s head? President Trump Signs Executive Order Banning Impeachment -Fiction! Man Catches 13 Pound Bullfrog in Texas-Truth! & Misleading!